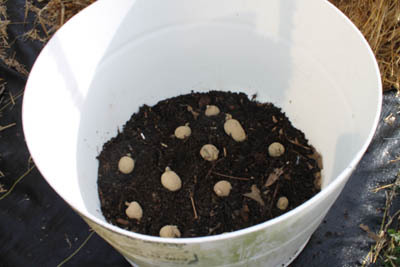 Gardening Tips for Small Spaces: Seed Potatoes in a Barrel! Seed Potatoes in a Barrel! I have very little sunny space for gardening in my yard. This year I am doing Straw Bale Gardening and I will post my experiment here soon. 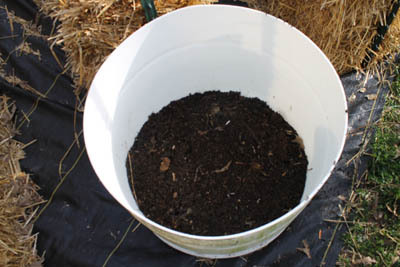 In addition, I am growing potatoes in half barrels. My son gave me a big white plastic barrel that had been around his work yard for years. It had not contained anything hazardous. Bill sawed it in half and drilled 1/2 inch drainage holes around the sides and in the bottom of the half that was the barrel bottom. 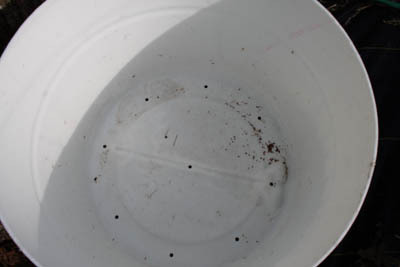 Here's what the bottom of that barrel looked like when Bill was finished drilling drain holes. I used a coffee filter to cover the big hole that was in the top. As the potatoes grow, I will keep covering the vines, leaving a few leaves to soak up sun, until the vines reach the top of the barrel. At that point I will let them spill over the sides till it's time to dump out my harvest! I'll post more as they grow.